The first crash test in the history of Mercedes-Benz took place on 10 September 1959, when a test car was accelerated head-on towards a stationary obstacle. Safety research at the brand suddenly entered a new era, for now the behaviour of vehicles and occupants in car accidents could be investigated in realistic circumstances using test cars and crash test dummies. In the decades that followed, Mercedes-Benz continued to set new standards in a line of research that applied throughout the industry and thus achieved lasting improvements in vehicle safety for the benefit of all road users. Although to begin with crash testing remained on a relatively small scale, from the 1960s onwards the procedure became increasingly established as a reliable instrument for optimising and testing vehicle safety. And at Mercedes-Benz thorough crash testing was applied not only to passenger cars, but also to vans, commercial vehicles and even coaches. Crash testing at Mercedes-Benz has always exceeded the number and severity of the tests prescribed by law. In the case of the E-Class from the 212 series, for example, the programme that developed the saloon to production standard involved over 150 crash tests and over 17,000 realistic crash test simulations. These included a number of particularly severe crash tests conducted specifically by the company above and beyond the 40 or so different prescribed collision configurations required for the ratings and worldwide authorisation of a vehicle. Even the first crash tests in 1959 were characterised by these same high aspirations towards in-house development work. Mercedes-Benz began taking a more rigorous approach to vehicle crashworthiness over 20 years before the first crash test. But although Mercedes-Benz engineers carried out the first tests on vehicles as far back as the 1930s, these were not for the purpose of research into passive safety. They served in fact to remedy the unwelcome effects of oscillating vibrations. 1939 was a key year in the history of safety at the Stuttgart brand, for this was the year Daimler-Benz AG signed up the engineer Béla Barényi. His developments were to prove definitive in terms of passive safety for the modern passenger car. Barényi’s inventions were described in over 2,500 patents and included the safety body with rigid passenger cell and front and rear crumple zones (premiered in 1959 in the W 111 series) and the safety steering wheel, which made its debut in 1976 in the 123 series. Barényi and his colleagues developed the safety body to production standard in the 1950s, the crumple zones of which were designed to absorb the kinetic energy of a crash by controlled deformation. The prevailing view at this time was still that the interests of occupant safety were best served by maximum rigidity of the body. However, the new crash tests introduced in 1959 showed that although bodies such as these were good at withstanding impacts, most of the kinetic energy released was transmitted to the vehicle occupants and often led to serious injuries. Crumple zones, on the other hand, significantly reduced the amount of energy transmitted to the occupants in the event of an accident. The safety body patented in 1951 marked a decisive advance for passive safety. Barényi’s development was the result of precise observation, a great technical imagination and a capacity for visionary thinking. But many other aspects of the passenger car in addition to the body structure were improved and revised in terms of safety during this period. These included details such as the door locks, interior upholstery and padding, windscreens made from safety glass and seat belts. During the 1950s the Daimler-Benz engineers watched closely to see how crash testing established itself as a new instrument of research and development in the United States. Visits to American universities and car manufacturers provided the experts from Stuttgart with inspiration and ideas for their own component testing and crash tests. One such visit was made by Karl Wilfert, Rudolf Uhlenhaut and Fritz Nallinger to Ford’s crash testing facility in Dearborn in 1955. The men from Stuttgart were surprised to discover that Ford was already using accident research for aggressive marketing purposes at that time. This would soon influence the way Mercedes-Benz dealt with the sensitive issue of vehicle safety. In addition, from the 1960s onwards representatives from Mercedes-Benz also began taking part in the Stapp Car Crash Conferences. One of the main contributions from Stuttgart in the early years was Karl Wilfert’s 1966 presentation entitled “Comprehensive Vehicle Safety Development”. The new W 111 series was the first to benefit from preliminary vehicle safety tests conducted by the engineers. Although there were as yet no crash tests in the precise sense of the term, the company’s own researchers had already begun testing individual vehicle components for their behaviour in accidents since 1956 and 1957. The inception of these tests represented a major watershed in the safety research of the Stuttgart brand. For until then the only information concerning passive vehicle safety had come from expert inspections of crash vehicles. As far as component testing was concerned, the engineers focused initially on parts from the vehicle interior. In so doing they were able to apply existing methods used by the glazing industry, where a few years earlier a simulator had been developed to study the behaviour of safety glass; this was used to simulate the impact of a human head against the front windscreen. Mercedes-Benz used a similar design of apparatus, for example, to test the padded surface of instrument panels: a spring fired a five-kilogram wooden ball at the component being tested, while a tracer registered the deceleration of the artificial head striking the padding. Gradually the engineers used the dummy head to test other components of the vehicle interior. Such tests showed the inherent dangers not only in protruding components, but also in wooden trim, which had a tendency to splinter. However, since many customers – in particular those buying luxury class models – preferred genuine wood as a material for interior equipment, Mercedes-Benz developed a multilayered composite material, in which the wood was prevented from splintering by aluminium inserts. The development of the safety belt in the late 1950s also called for a reliable testing procedure for this new restraint system in vehicles. The solution developed in 1959 was the test sled, originally suspended so that it could be swung with acceleration against a fixed object. This initial model subsequently gave rise to the horizontal test sled on rails, which was accelerated using steel springs. The ‘guinea pig’ used was a dummy acquired in the United States. This early test dummy, also used in crash testing, was given the name Oskar by its guardians. As a mute pioneer of safety research at Mercedes-Benz, Oskar went on to spawn future generations of dummies. Indeed, the climate dummy, developed in 2007 to test for specific perception of vehicle temperatures, was named Dr. Oscar. As well as the safety belt, the accident simulator was also used to test the padded steering wheel impact absorber and other such components. By the mid 1960s the first-generation sleds had given way to a new type of impact vehicle, to which a complete passenger car body could be attached for load testing if required. The goal of all developments of the Mercedes-Benz accident researchers in the late 1950s was to simulate a crash as comprehensively as possible. Consequently there was no way round the crash test – which was time-consuming, difficult to control and costly. This test procedure involved subjecting a vehicle to a controlled collision that resulted in corresponding deformation. The roles of the vehicle occupants were played by the crash test dummies. At the first Mercedes-Benz crash test in 1959 a test car was accelerated head-on into a fixed barrier made of old press dies otherwise destined for the scrapheap. After this premiere the engineers paused for a while in order to evaluate the new procedure. Then crash testing was conducted again on three further test days between March and April 1960. This included the simulation of complete accidents – for example, the side-impact collision between a vehicle from the W 111 series and a saloon of the same series. Once again, head-on collisions were carried out and for the first time roll-over tests. Pioneering tests with older cars made possible the design of a ramp that rotated the test cars about their longitudinal in mid-air so that they landed on their roof. This meant the safety experts were able to measure the reaction of the body in the event of a roll-over accident. Another key element during this second year of crash testing was the company’s public relations policy on matters to do with accident research. Daimler-Benz invited the press to attend the day of testing on 11 April 1960 in order to give an official presentation of the latest approaches to safety research. In so doing the experts clearly ranked the importance of vehicle safety above previously held concerns about elaborating on the issue of accidents in customer communications. Mercedes-Benz crash testing from 1959 onwards led not only to advances in vehicle safety. The technology used for these spectacular crash tests was also constantly improved. To begin with, for example, a winch was used to accelerate the cars, since this could not be done under the power of their own engines. The engineers borrowed winching technology used by the glider pilots at the Technical University to launch their aircraft. At Mercedes-Benz, however, the tow was used to launch brand-new saloons so that when they took off from the so-called corkscrew ramp at speeds of 75 to 80 km/h they rolled over in the air. However, the winch system proved less than ideal for accelerating the test cars. And the head-on test also left much to be desired, as on occasions the test vehicles missed the barrier or stationary car altogether, resulting in a rescue call-out to the plant fire service. For in those days testing was conducted in the open air on premises belonging to the Sindelfingen plant. The area was bordered by a stream named the Schwippe – the final resting place for more than one vehicle during these pioneering years. In 1962 Ernst Fiala came to the rescue. For the crash experiments conducted by Karl Wilfert and his team, Fiala designed a hot-water rocket that powers the vehicles without the use of a tow line. Fiala received critical advice for his design from the Institute for the Physics of Jet Propulsion based at Stuttgart Airport. Mounted on a single-axle trailer, the apparatus was attached to the rear of the test vehicle and consisted of a pressure tank, a fast-opening valve and a discharge nozzle. To create thrust, the tank was three-quarters filled with water prior to the experiment and heated until the water temperature reached around 260 degrees Celsius. When the valve was opened, this excess pressure accelerated the car and rocket ensemble to speeds in excess of 100 km/h. The introduction of the hot water rocket in 1962 also led to improvements in the test track. Reinforced concrete was used for the runway, and the test vehicles and propulsion system were now guided on rails. A fence was also erected to prevent cars landing in the stream. Such clear improvements to the test facilities were not only important for in-house testing. From 1962 to 1967 Mercedes-Benz also carried out testing on new types of crash barriers on behalf of the State of Baden-Württemberg. In addition, in 1964 the test strip was lengthened from 65 metres to 90 metres in order that heavier passenger cars such as the 600 from the W 100 series could also be subjected to crash testing. The great advantage of crash tests over crash vehicle analysis lay in the opportunities these offered to record the actual events of the crash in every detail. The necessary analytical technology to do this had been developed in the years prior to 1959. This included the use of acceleration sensors fitted to the dummies and the test car itself, as well as high-speed film that could reproduce images in extreme slow motion for purposes of collision analysis. The use of simulation dummies ensured very diagnostically conclusive results, since the dummies equipped with capsules for recording acceleration values – which had been in use in the United States since 1952 – for the first time produced repeatable data relating to the stresses to which the human body was subjected in a car accident. Oskar, the VIP-type dummy produced by manufacturer Alderson Research, initially remained the only test dummy used for early crash testing in Sindelfingen. Front seat passengers were simulated more often than not using sandbags or shop-window mannequins. Even when other more advanced test dummies were acquired later (in 1972 eight units were in use altogether), Oskar continued to provide invaluable service – indeed this first ever test dummy went on to serve the Stuttgart brand’s safety research department for three decades. However, the dimensions and data recording methods of the dummies soon began to differ from the VIP model. In the 1960s dummies were designed with body proportions in line with the average size of the typical man, woman and child. The precision with which specific test types were conducted was also constantly improved – in addition to dummy passengers there was also a test dummy for simulating accidents involving pedestrians. 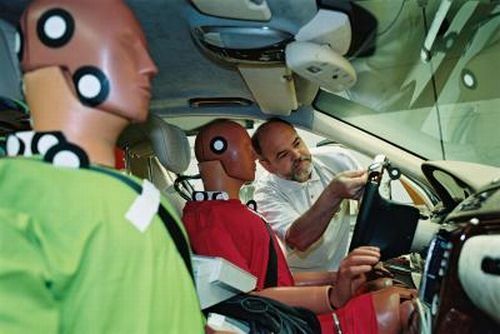 Dummies were also developed to measure specific accident scenarios with great precision, as well as highly specialised dummies for tests other than crash tests – for example, the climate dummy, used to establish the influence of air temperature and humidity on the human body. The increasing number of crash tests and the increased importance attached to the results of these tests revealed the clear capacity limitations and suitability of the old test track in Sindelfingen by the late 1960s. So a new accident research centre was built in Sindelfingen between 1971 and 1973. Initially the safety researcher installed a Bendix sled for crash simulation purposes. Then in 1972 construction work began on a new crash installation that would also facilitate head-on and side-impact collisions. As a drive system to propel the test vehicle along the 65-metre test track the engineers opted for a linear motor with a thrust of 53,000 Newtons. This power unit accelerated the cars to the target speed over the first half of the track, then regulated the speed over the remaining distance to the desired value before decoupling in advance of the collision. In one direction of the track the test cars crashed into a 1,000-tonne barrier resting on a sensitive force plate. Roll-over tests were conducted in the opposite direction. Collisions involving other vehicles, on the other hand, were still conducted on an open-air site. From the outset, one goal of Mercedes-Benz crash testing was to produce results that were as realistic as possible. Increasingly, therefore, the head-on collision into a rigid barrier made of old iron or concrete was replaced with an offset crash. Research into offset collisions began in 1975. In 1992 this offset front impact was conducted for the first time at Mercedes-Benz using a deformable barrier in order to produce results that were even more comparable with the behaviour of a vehicle in a real collision. A non-rigid barrier was subsequently developed for European car testing, the design of which had a significant influence on test results from the Sindelfingen safety centre. With the introduction of offset barrier testing, this new European test approach represented a further major advance in the direction of realistic accident research. In 1993, the offset crash against a deformable metal barrier with a honeycomb structure at 60 km/h and with a 50 percent overlap became the new Mercedes-Benz standard. When the Mercedes-Benz Technology Center (MTC) was created in 1998 (the foundation stone was laid in 1995), the crash testing facilities at Sindelfingen also underwent modernisation. The acceleration strip was now lengthened to 95 metres, which meant that all types of crash tests could now take place indoors. In particular this applied to the offset crash, which in reality was a much more frequent occurrence than the head-on collision of a vehicle. Now, however, even head-on collisions between two vehicles could be carried out indoors, since the linear motor was also replaced with a cable winch system. High-speed film cameras were no longer used to record the tests; instead the crash process was recorded using video technology. The very high frequency of the image series remained unchanged so that the crash tests could be analysed in detail in extreme slow motion. During the rebuilding work, the extension to the test facility was also given a roof, which meant that tests with both passenger cars and commercial vehicles could now take place regardless of the weather outside. In view of the comprehensive research and test programme at Mercedes-Benz, the decision was taken soon after the year 2000 to expand the MTC in Sindelfingen once again. At the symbolic ground breaking ceremony in July 2007, Thomas Weber, member of the Board of Management of Daimler AG with responsibility for Group Research and Mercedes-Benz Cars Development, presented the new project representing an investment worth 100 million euros: “Expansion of the Mercedes-Benz Technology Center is a significant measure to further consolidate our leading position in terms of both technology and competitiveness.” This expansion included the installation of new large-scale test rigs such as climate tunnel and driving simulators; these are scheduled to come on-stream in 2010. In 2009 Mercedes-Benz presented the pioneering PRE-SAFE® simulator at the 21st ESV Conference. 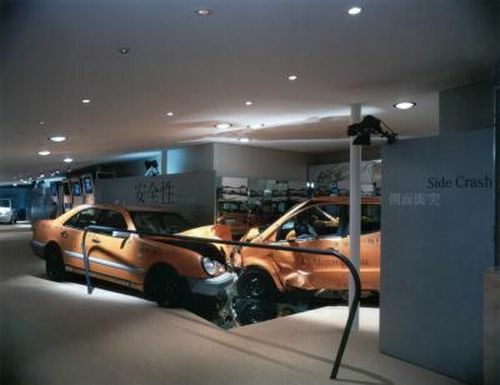 This accident simulator was the first such system to use a linear motor to accelerate the vehicle cabins to speeds of up to 16 km/h within a space of four metres prior to collision. The drive was pre-programmable and also worked in the opposite direction. This made it possible to demonstrate various acceleration profiles as well as rear-end collisions. In this way the testers in the simulator experienced in real-time the effect of PRE-SAFE® functions such as seat belt tensioning, NECK-PRO and inflatable side bolsters in the seats. With this simulator Mercedes-Benz engineers have also used analysis of the simulated pre-crash phase to improve impact situations. The ESF 2009 experimental vehicle, presented in 2009, comes in a long tradition of safety research at Mercedes-Benz. For the ESV safety conferences in the period 1971 to 1975 the Stuttgart safety experts built and crash tested more than 30 experimental vehicles. Crash tests are not to be seen as the only instrument in the history of Daimler-Benz safety and accident research. 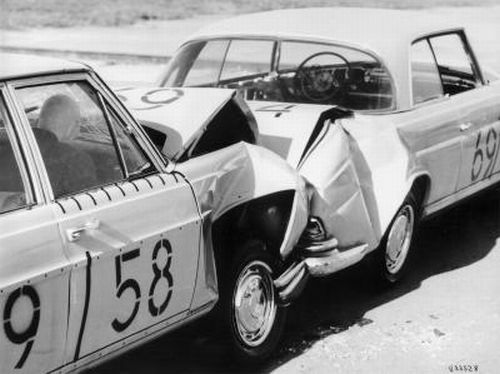 For crash tests have always been influenced by the findings of other disciplines, such as the systematic accident research adopted by the Stuttgart company in 1969. For example, analysis of real accident scenarios showed that a full head-on impact was relatively rare and that most accidents involved an offset head-on collision. Crash testing scenarios were modified accordingly. Accident specialists invest a great deal of time and effort in order to deliver the most direct and objective analysis possible for accidents in road traffic. Following pilot testing in 1967, ongoing accident research at Mercedes-Benz was launched in 1969, in which engineers provided prompt analysis of collisions involving Mercedes-Benz vehicles in Stuttgart and the surrounding area. In this way the studies conducted by accident researchers regularly provided important evidence about vehicle parts that required specific improvement in terms of passive safety. The results could then be tested using accident simulations and crash tests. With the increasing performance capabilities of computer technology, however, computerised multi-body systems also began to complement conventional crash testing. The first digital crash computations based on digital models of complete vehicles were available for the E-Class from the W 124 series, which made its debut in 1984. Neverthless, the classic crash test is still used by Mercedes-Benz developers even today.